Adapted with permission from Changing Vancouver. Visit their blog for more fascinating stories of Vancouver’s past. The Ceperley residence in 1888 at 1116 West Georgia. Things have changed, a bit, since 1888. 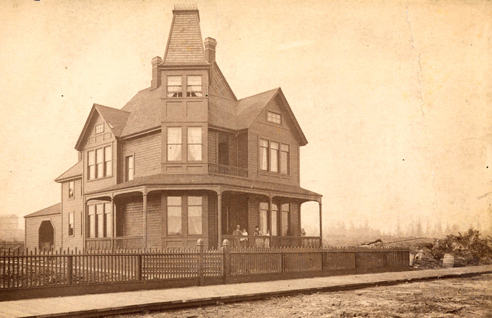 This 1888 picture shows the newly completed home of Henry and Jennie Ceperley. Born in Oneonta, New York, in 1850, Henry went to school locally, and then became a local school teacher before moving to Minnesota at age 21 and starting work in the produce and commission business. Five years later he moved to New Mexico, where he worked as a cashier and bookkeeper for a company that was building the Atchison, Topeka and Santa Fe Railroad. Henry married in 1881, back in Minnesota, and in 1883 he moved to Livingstone, Montana, where he stayed for about three years. He worked in the cattle ranching business, and also set up an insurance agency. He arrived in 1887 in Vancouver with his young family, and by 1888 was living in the new house in the picture. It was still the only house on this part of the block in 1891. In the picture Henry's daughter, Ethelwynn, was aged four, and son Arthur was two. His wife, Jennie, was 13 years younger than Henry. Ceperley partnered with A. W. Ross to form the real estate business of Ross and Ceperley. Arthur Wellington Ross, a Manitoban lawyer, politician, and land speculator, by the late summer of 1884 was in Vancouver acting on the CPR’s behalf to assemble land for its western terminus at Granville. Ross also was ideally placed to speculate himself and he purchased town-site lots from the CPR. In 1886 he opened a real estate business, which was run for a short time by his brother-in-law, the city's first mayor, Malcolm McLean. In 1888 the Lady Stephen Block became the Post Office, and also home to Ross and Ceperley, who became one of the most active real estate promoters in the city. By now Ross was only a part-time resident in the city; he had rooms in the Hotel Vancouver, but in 1887 he had been reelected, with a little help from the CPR, as a Conservative in a Manitoba riding, so divided his time between Vancouver, Manitoba and Ottawa. By 1891 Henry Ceperley had moved out of the house, which was now occupied by Isabela McLennan, and J.C. Keith, the manager of the Bank of British Columbia. Ceperley had dropped his partnership with Ross (who moved back to Manitoba in 1891), and was now managing director of the Vancouver Loan, Trust, Savings and Guarantee Co, with offices on Hastings, in what was then known as the Thompson-Ogle Block, and he had moved house to Burrard Street. Ceperley’s house was apparently replaced with two houses before 1912. They in turn were redeveloped with two car dealerships around 1920. In 2008, the 62 storey Shangri La Hotel and condominiums was completed here. 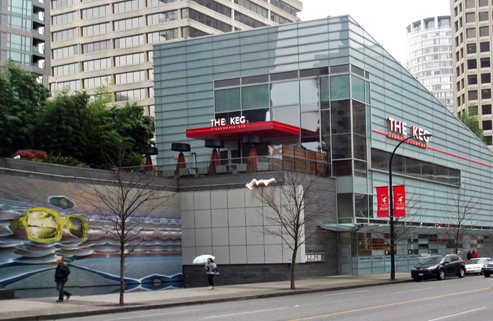 Where the house and car dealerships stood is part of the development: an Urban Fare store to the west and an art instillation location curated by the Vancouver Art Gallery with regularly changed site-specific artworks.